This book engages the notion of cosmopolitanism as it applies to intercultural communication, which itself is undergoing a turn in its focus from post-positivistic research towards critical/interpretive and postcolonial perspectives, particularly as globalization informs more of the current and future research in the area. It emphasizes the postcolonial perspective in order to raise critical consciousness about the complexities of intercultural communication in a globalizing world, situating cosmopolitanism—the notion of global citizenship—as a multilayered lens for research. Cosmopolitanism as a theoretical repertoire provides nuanced descriptions of what it means to be and communicate as a global citizen, how to critically study interconnectedness within and across cultures, and how to embrace differences without glossing over them. Moving intercultural communication studies towards the global in complex and nuanced ways, this book highlights crucial links between globalization, transnationalism, postcolonialism, cosmopolitanism, social injustice and intercultural communication, and will help in the creation of classroom spaces devoted to exploring these links. It also engages the links between theory and praxis in order to move towards intercultural communication pedagogy and research that simultaneously celebrates and interrogates issues of cultural difference with the aim of creating continuity rather than chasms. 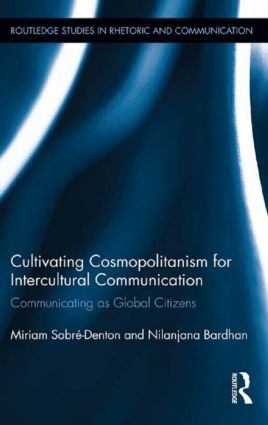 In sum, this book orients intercultural communication scholarship firmly towards the critical and postcolonial, while still allowing the incorporation of traditional intercultural communication concepts, thereby preparing students, scholars, educators and interculturalists to communicate ethically in a world that is simultaneously global and local. Winner of the National Communication Association's International and Intercultural Communication Division's 2014 Outstanding Authored Book of the Year award. Miriam Sobré-Denton is Assistant Professor in the Department of Speech Communication at Southern Illinois University, Carbondale, USA. Nilanjana Bardhan is Associate Professor in the Department of Speech Communication at Southern Illinois University, Carbondale, USA.